Il uomo morto, the dead man, is a cluster of mountains that, when viewed from a certain angle, looks like a man lying down. The day I took the photo was a bit hazy, but you can see why the mountains got their name. I was in Pieve Fosciana in Garfagnana when I took the photo. 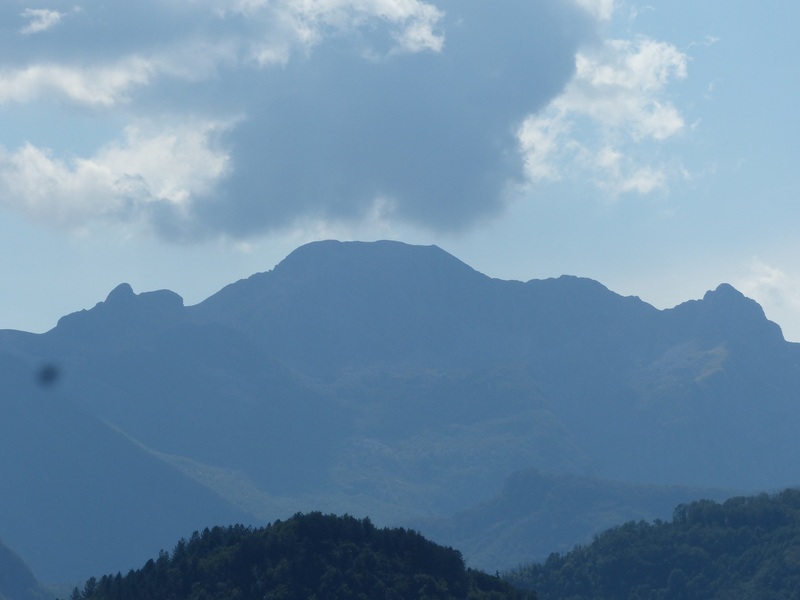 This entry was posted in Garfagnana, Things to see and do and tagged Appenine mountains, Garfagnana, Italy, mountains, Tuscany, Uomo morto by Debra Kolkka. Bookmark the permalink. The profile is quite definite. I was impressed. I have seen it before, but not as clearly as this. and you certainly got the correct angle! There is a similar formation where I live close to the Pennines in the North of England, it’s known as Indians Head as it looks like an Indian chief reclining. Yes, I was in just the right spot. thank you for this item. You could / should know that this “dead man” is not anyone, but is considered to be the figure of the great poet Dante, lying down, resting a while, at about 1600 mt above sea level, near Rifugio “Enrico Rossi”, between the both famous peaks of northern Tuscany ( le due “Panie”) : La Pania Secca – at the left side of the head , and La Pania della Croce, at the right side. You can climb up unto the nose of Dante, but you shouldn’t do it for several reasons; respect – he don’t like it- and it is dangerous. Better climbing up to the Pania della Croce and enjoy seeing the Thyrryn sea/ il Mare Tirreno. Most beautiful very early in the morning when you can see the shadow of the mountains in the sea. Thank you for the information. I have not heard that…how interesting. Looks remarkably like a man lying down. Sounds like Agostino has done the hike up the mountain at some stage….the word ‘mountain’ makes it sound like a hard climb. It is a climb I won’t be doing. I like to look from afar. There are many legends surrounding the l’uomo morto in addition to the one given by Agostino. My favourite is about two giants who were fighting on the crest of the Apennines (above Pieve Fosciana). One picked up the other and hurled him across the Serchio River Valley. He landed on his back on the top of the Alpe Apuane and has been there ever since. I like the giant option.